I can already tell these guys are going to have character, and not just because I took a peak at their page in the caterpillar guide! Fuzzy and striped, they inspired me enough to make them the banner of my blog. Cute and tiny and eating like it’s their job, most of them are doing wonderfully. A bunch did not survive, perhaps not getting food soon enough after hatching? Or maybe I was too rough with the paint brush? 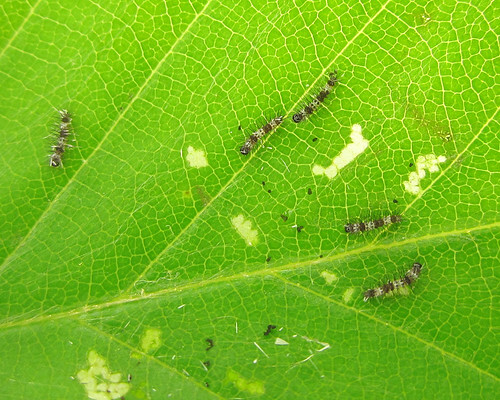 Here they are close up, a little bigger (but still 1st instars) and with even more personality. Even though their bodies are larger, their heads are still the same size, which only change when they molt. I got to watch a bunch of them as they finished up their molts into the second instar. They’re fuzzier and stockier, still with the banded pattern. You can see some of them still have their head capsules stuck to their hairs! While the rest of the body scrunches off sort of like a snake shedding its skin, the head coverings pop off. 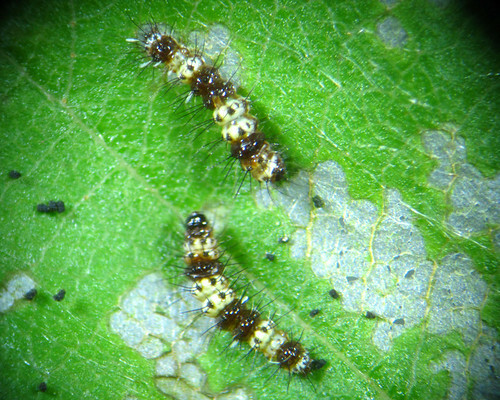 They are easier to measure this way, instead of on the living caterpillar, but when they are very small they can be hard to find (especially for species that are white/clear in the early instars). Note that when they first shed, they are pale yellow and brown – but as they toughen up, they become more white and black. Their head capsules start out yellowish (like the guy on the bottom right), and then darken. 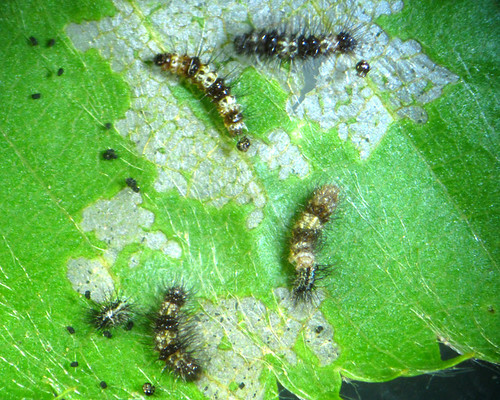 I am very interested in watching this species change as it grows, so I am preserving a few of each instar in alcohol, and trying to get good photos. It’s tricky when they’re so tiny, and I don’t have a very good camera at the moment, but playing with the scope has been fun so far, and I can see the basic patterns. Posted on May 28, 2011, in Acronicta, Noctuidae. Bookmark the permalink. Leave a comment.